Hyssop (Hyssopus officinalis, Linn.) is a perennial evergreen undershrub of the Labiatae, native of the Mediterranean region. Though well known in ancient times, this herb is probably not the one known as hyssop in Biblical writings. According to the Standard Dictionary the Biblical hyssop is an unidentified plant, thought by some to have been a species of marjoram (Origanum maru); by others, the caper-bush (Capparis spinosa); and by the author of the History of Bible Plants, to have been the name of any common article in the form of a brush or a broom. In ancient and medieval times hyssop was grown for its fancied medicinal qualities, for ornament and for cookery. Except for ornament, it is now very little cultivated. Occasionally it is found growing wild in other than Mediterranean countries. The smooth, simple stems, which grow about 2 feet tall, bear lanceolate-linear, entire leaves and small clusters of usually blue, though sometimes pink or white flowers, crowded in terminal spikes. The small, brown, glistening three-angled seeds, which have a little white hilum near their apices, retain their viability three years. Leaves, stems and flowers possess a highly aromatic odor and a hot, bitter flavor. Hyssop succeeds best in rather warm, limy soil. It may be readily propagated by division, cuttings, and seed. In cold climates the last way is the most common. Seed is sown in early spring, either in a cold frame or in the open ground, and the seedlings transplanted in early summer. Even where the plants survive the winters, it is advisable to renew them every three or four years. When grown in too rich soil, the growth will be very lush and will lack aroma. Plants should stand not closer than 6 inches in the rows, which should be at least 18 inches apart. They do best in partial shade. 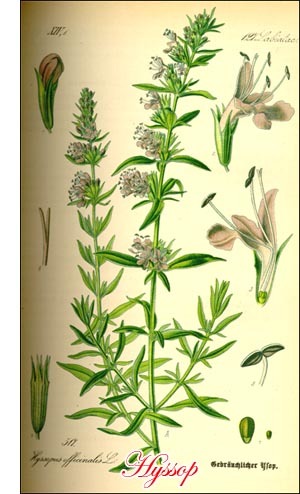 Hyssop has almost entirely disappeared from culinary practice because it is too strong-flavored. Its tender leaves and shoots are, however, occasionally added to salads, to supply a bitter taste. The colorless oil distilled from the leaves has a peculiar odor and an acrid, camphorescent taste. Upon contact with the air it turns yellow and changes to a resin. From 400 to 500 pounds of the fresh plant yield a pound of oil. The oil is used to some extent in the preparation of toilet articles.